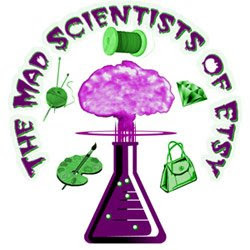 Ulixis Crafts: Mad Scientists of Etsy! I joined a street team! The Mad Scientists of Etsy (MSOE)! I met a member in the forums (jvdarcy), and she directed me to the team thread, webpage, and other links. I was welcomed immediately and I'm really excited to be part of this team. Science is a huge part of my life, and I'm excited to start bringing that aspect into my crafting. Each month the MSOE team has a challenge. The theme will rotate between fields of science, well-known scientists, and science phrases or terms. For August, it was microbiology. As soon as I learned this, I went and dug out my old microbiology notes from my not-so-efficient filing system. I don't like to keep all my school notes, but I keep the important stuff ~ usually a dozen or so pages I summarized everything on in order to study. 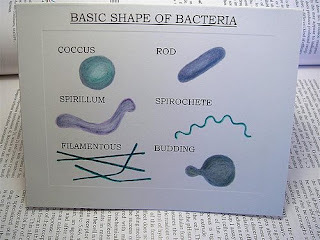 The first thing I saw in my microbiology folder was this chart for the basic shapes of bacteria. I was immediately struck by how perfect this chart would be for notecards or postcards. I originally tried making postcards. But the heavy card I had at home was too flimsy to make a reliable postcard. So with my design in mind, I went to Grand & Toy yesterday. Unfortunately, they didn't have any postcards, but they did have some cute notecards with matching envelopes (by Avery - these ones are ivory, embossed and are 4.25 x 5.5"). 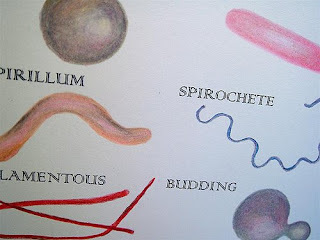 So I printed up the words in 2 different fonts, and drew in the bacteria by hand using pencil crayons. I even used a technique called burnishing I picked up off of jvdarcy's blog. 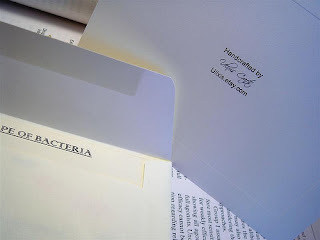 I made 2 cards (sold as a set) ~ different font and different colour for the bacteria. I think they turned out really nice! Cool post! Thanks for the mention of both my shop and my blog! Your microbes are pretty cool!